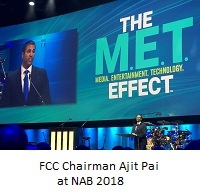 FCC Chairman Ajit Pai enjoyed the enthusiastic welcome he received at this week’s NAB 2018. Pai, who has publicly and consistently supported broadcasters, assured station owners the Commission will continue to reduce unneeded regulations that inhibit the industry. At the show last year, he announced the FCC would launch a review of 1,000-plus pages of media regulation, to identify rules that can be cut or updated. The Commission began eight rulemakings to do that; he promised to start more “in the coming months,” in a speech Tuesday afternoon. “When you look at all of our media decisions together, the larger picture becomes clear: we are simply allowing any and every broadcaster the ability to compete in a free market, unshackled by regulations that no longer make sense,” said Pai. He noted the agency approved rules authorizing the next-gen television standard in November. “Some demanded that we strangle Next Gen TV in its infancy with extensive regulation—regulation they’d never think of foisting on video services of Silicon Valley giants.” He looks forward to seeing the consumer benefits of the new technology. His big news concerned radio. With the proliferation of new FM translators, interference complaints have increased. Pai announced he circulated among his colleagues a proposal to update the FCC’s FM translator interference rules to simplify and expedite the complaint process. The proposal would allow translators to resolve interference by moving to any available frequency using a minor modification application; it also requires a minimum number of interference complaints to support any interference claim. NAB supports the move and filed a Petition for Rulemaking on the subject.